The legacy may lie in the songs hooked up by country music in the 1990s or in a trio of dominant albums blossoming in the 2010s. 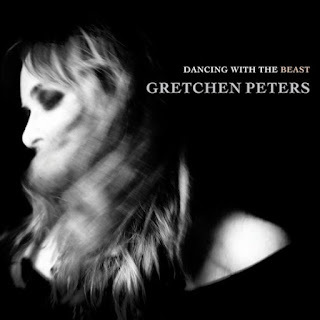 Maybe though, the legacy is still to come such is the trajectory in the quality of output from Gretchen Peters. The most important thing about a new release is that it is just the start of a cycle. In essence, DANCING WITH THE BEAST will be effectively born on May 18th, with several years of burgeoning appreciation set to follow. While the discography stretches back twenty plus years, the cycle of slow growth began with 2012’s HELLO CRUEL WORLD, which reached full bloom here a couple of years later. That is symptomatic of a Gretchen Peters record, it is not designed for the ‘here today; gone tomorrow’ society. There is stamina, staying power and subtle variances that await discovery. The case for reviewing her albums twelve or twenty four months down the line is compelling. At these points, different perspectives are certain to exist rather than cobbling together something definitive on release day. However, getting your ears wrapped around this record as soon as the traps lift is still the only place to be. In effect, start your voyage of discovery from day one. Fans of Gretchen Peters will know what they are getting from the new record. This is confirmed. First impressions (ok plays running into double figures) see the stars of song writing, production and thematic perception perfectly aligned as the eleven songs blend into the spirit of an explorative entity. Whether in character narration mode or digging deep into personal feelings, the impact slices with a cutting edge. One hopes that the lines between the two states are less than blurred such is the dark overtures that drape over a number of the tracks. The strength of any album lies within the pull of wanting to unravel the layers and ultimately search for your own meanings and interpretations. DANCING WITH THE BEAST exchanges the baton of ownership once landing on the ears of the listener. Questions spill out of track after track, with the only desire of conjuring up the answers yourself. Is the central character of ‘Wichita’ irrational or in control? Was there an audience member in ‘The Show’ waiting for that performance of a lifetime? Can the final ‘Disappearing Act’ be averted? In these times where many outlets give the artist an extended voice, it can be devilish to summon up your own interpretations. The Gulf of Mexico in ‘Lay Low’ can re-invent into any place of personal sanctuary, while the simplicity of ‘Love That Makes a Cup of Tea’ is a message to us all to steer clear of complications, an exception though when it comes to splitting hairs in the process of feasting on quality lyrics. The key to DANCING WITH THE BEAST is now in your possession. It would be unwise to let this record pass as the year rolls along. Happy listening if it you have got the right state of mind. There is lightness in the dark and a touch of shade when it gets too bright. Gretchen Peters is on top form and a truly great songwriter. Finally, who or what is the beast? Answers only required within your mind.